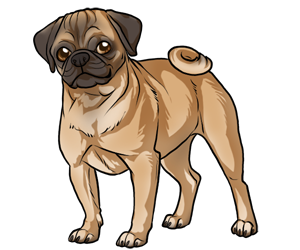 Perhaps one of the oldest breeds of dogs in the world, the pug originated before 400 BC as a companion lap dog. It is most commonly believed that the pug came from Asia. However the oldest known records come from China where they were used as companion dogs in Buddhist monestaries in Tibet. There are also records of the breed in Japan and Europe around the 16th century. The breed was brought to America in the 19th century and recognized by the AKC in 1885. It is likely that the pug is the ancestor of the modern day Pekingese and King Charles Spaniel. Today the pug is still a popular family pet and makes a good watch dog. The pug is a common breed to see in movies including Men in Black, The Adventures of Milo and Otis, Disney's Pocahontas, and many other popolar movies. The first emperor of China destroyed all records of the pug during his reign. On Napoleon of France and his wife's wedding night, Josephine insisted that if Napoleon did not let her pug sleep on the bed then she would not sleep there either.